A sparkling smile not only gives you confidence, but also creates a positive impression with everyone you meet. Luster 2 Minute White claims to help you achieve a brighter grin in just days. As someone who prides myself on a sharp-looking smile, I wanted to put it to the test. The product was provided to me at no charge, but all opinions are my own. 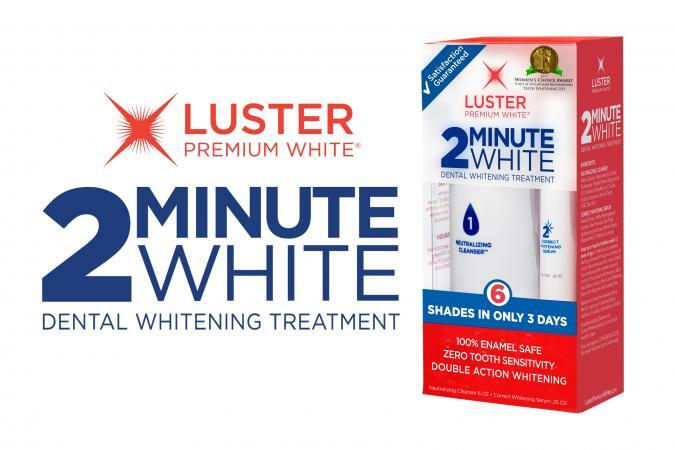 Luster 2 Minute White is a two-step teeth whitening system. The first step involves rinsing teeth and the second is the whitening application. The company claims it can whiten teeth up to six shades in as little as three days although results will vary by individual. Active dental peroxide is the tooth whitening agent. Rinse teeth with 1 tablespoon of the Neutralizing Cleanser for at least 10 seconds. Shake the Correct Whitening Serum; take off the cap and squeeze until it appears on the brush. Apply the serum over your visible teeth on the top and the bottom. Keep your tongue and lips away from your teeth for 30 seconds. Do not eat or drink anything for 10 minutes in order to allow the serum to work. Luster 2 Minute White won the 2017 Women's Choice Award for Teeth Whitening Kit. Verily recommends it as a cheap whitening option, calling it "extremely user-friendly." While the directions for Luster 2 Minute White indicate they can be done in four treatments over three days, I did them three times a day over four days. However, you can take the full 12 days to complete the entire cycle; the company recommends completing all 12 treatments for optimal results. Since it's hard to see results changing over time, I took photos of my smile before I started treatments and after I completed them. I do have slight discoloration on my left front tooth which will not be affected by any whitening agents. I also am wearing lipstick in the second image. As the pictures show, I don't feel I achieved the potential six shades of whitening; perhaps more like two shades. However, I do feel like my teeth have been brightened and lightened - the dullness has disappeared. My teeth also appear to be more of a true white rather than a grayish white. Initially, I was hesitant to use the cleanser. However, that ended up being my favorite part of the routine. My mouth felt clean and refreshed after each use! The gel application serum was easy to use and went on easily. You do need to press down a little harder than expected and do it several times to coat your teeth thoroughly. I had to hold my bottom lip out a bit and contort my face just a little to keep my lips from touching the serum until after the prescribed 30 seconds. However, I could easily relax after this and had no trouble. I would definitely try the Luster whitening products again, especially if I had gray stains compared to yellowing. Luster Premium White products, including the Luster 2 Minute White, are available online and at stores located near you such as Walmart and Rite Aid Pharmacy. Expect to spend about $13 for the kit if you want to experience Luster teeth whitening in just a few minutes a day for yourself!